Hello and welcome to this festival goer's guide to Glastonbury. It's designed to provide illustrated answers to the most Frequently Asked Questions which pop up on social media and festival website message boards by utilising a small selection of the ever-expanding library of photos I have taken at the festival over the years. I hope that you find it to be informative and useful. It's an ongoing and constantly evolving project which I first dreamt up some 15 years ago in order to show new visitors (or Glastovirgins as we affectionately call them) what the festival is all about and also to give a pictorial guide to a lot of the attractions and facilities which make Glastonbury stand out as the UK's premier performing arts event. Newcomers make up an estimated 30% of the Glastonbury population each year and if you are going to be one of them in 2019 then the information provided here is predominantly for your benefit. However there might be a few useful tips in here for experienced festival goers too and I often get positive feedback from Glastonbury regulars who enjoy reading this every year in order to help get them in the mood in the build up to the festival. Although I have previously worked voluntarily on one of the Information Points at Glastonbury, I'm not employed by the festival or involved in any way in its organisation. So the contents of these pages are based entirely on my own independent punter's perspective. I've been to the last sixteen festivals stretching back to 1999 but I have friends who have been going since the 70's and also one who is now in her forties and has been to every Glastonbury since she was born. So I’m still barely reaching the point where I can really consider myself to be a genuine veteran. However I have clocked up a total of more than 160 festivals over a period of some thirty eight years and so I hope that the advice I give here can be considered useful, sound and based on experience. There is plenty more in the way of excellent advice to be found within the Information section on the Official Website. If you have any additional questions, comments or suggestions for improvements to these pages then I'd be delighted to hear from you. Please email me at faq@glastoearth.com and I’ll do my best to assist, or at least point you in the direction of somebody who can. The festival is always held on the first full weekend after the Summer Solstice, which generally coincides with the last full weekend in June. The dates of the next festival will therefore be from Wednesday 26th to Sunday 30th June 2019. There is no entertainment on the main stages until the Friday but the pedestrian gates open to ticket holders at 8 O'Clock on the Wednesday morning and the campervan fields and car parks open even earlier. So as far as I’m concerned the festival starts as soon as I pull on the handbrake in my van and doesn't finish until I head for home on the following Monday. In the past Glastonbury had to apply for its license annually and we would be on the edges of our seats every year, waiting to hear whether the license had been granted. But nowadays most of the issues for objection have been ironed out and the festival organisers have a much better working relationship with the local Mendip District Council. The festival also generates a considerable income for the local economy and as a result in 2007 the festival was licensed to take place for each of the following 4 years, which took us through to 2010. The most recent license was granted in advance of the 2014 festival and is valid for 10 years. Traditionally there has been a "fallow" year every fifth or sixth year in order to give the land at Worthy Farm a chance to recover and to give the Eavis family and a lot of the other people who work for the festival a holiday. The festival took a year off in 1991, 1996, 2001, 2006 and 2012. The most recent fallow year was in 2018 so it would be fair to assume at the moment that we won't have to find something else to do during the last weekend in June again until at least 2023. It's in Glastonbury surely! Well, not quite. Anybody who hasn't been to the festival before could be excused for assuming that it is held either in or very close to the Somerset town from which it takes its name, but this isn't strictly true. The site is on Worthy Farm, which is situated some 6 miles to the East of Glastonbury and 3 miles South West of Shepton Mallet, just off the A361 in the small rural village of Pilton. In fact a few of the locals still quaintly refer to it as the “Pilton Pop Festival” which is similar to the name of the first event held on Worthy Farm way back in 1970. The name Glastonbury wasn't used until the following year in 1971. How big is the site? Even if you've been to some of the larger and more commercial UK music festivals before, nothing will prepare you for the sheer vastness of Glastonbury. It's a full mile and a half from the farmhouse at the northern end to the stone circle in the south and it will take you a good hour to walk from one end to the other when there are more than 200,000 people on site. It is also more than a mile across from east to west plus at least an additional mile in each direction from the pedestrian gates to the furthest extremities of the car parks. This website gives you a good idea of just how huge the festival site is. If you enter your own town or postcode into the Location Bar it will place an outline of the festival site over your home town so you can get a real sense of the vast scale of the place. And don’t forget that this only covers the area inside the main fence and not the car parks, campervan fields, Worthy View or any of the other staff and boutique campsites which lie outside of the fence. Number of Stages - at least 100! Total Site Capacity - 203,000 (and that's not including children under 13, police and officials), or to put it into perspective, almost the same population as a city the size of Southampton!!! Details of how you can go about purchasing tickets for the festival have a tendency to change from time to time and your best bet is to keep an eye on the official website in order to familiarise yourself with the procedures and dates involved and thereby hopefully avoid disappointment. In the past tickets used to go on sale in early April. Sometimes they would sell out within a matter of hours whereas in other years you could still pick up a ticket just a couple of days before the festival took place. For several years now you have been able to pay a £50 deposit on the first or second Sunday of the preceding October in order to secure your ticket. According to updates which flashed up on social media at the time, all tickets for the 2019 festival were sold within 36 minutes of going on sale and before a single artist was confirmed on the line up. In some previous years it's taken even less time for all the tickets to be sold. The full price of a ticket in 2019 is £248 plus a £5 booking fee plus a further charge (£8:95 in 2019) for postage and packing for each order (of up to 6 tickets) placed. The balance is payable during a 1 week window at the beginning of April. For the last few years the organisers have made 15,000 coach package tickets available for sale 3 days prior to the main sale of the remaining 120,000 tickets. So if you are thinking of traveling by coach anyway, or you want to try to bag your ticket prior to the main sale, this may be an option worth looking at. In order to be able to buy a ticket you first have to pre-register and supply a passport style photograph of yourself as well as your name, address and post code. The photograph is printed on your ticket so that the stewards at the gates can identify you as the genuine ticket holder. Make sure you register well in advance of the actual ticket sale date as registration is closed a few days beforehand and your photo has to be examined to make sure that it meets the required standard. When you are paying the deposit for your ticket all you generally need are your registration number, which is notified to you by e-mail, and also the post code which you entered at the time of registration. You can buy up to 6 tickets in a single transaction but you must have the registration numbers and post codes for everybody you are buying tickets for. Prior to 2017 Credit cards were not acceptable for UK residents but this has changed and you are now able to use them. However if you use a Debit Card make sure you have enough funds in your bank account to cover the £50 deposits for everybody you are buying tickets on behalf of. Tickets are only ever sold through one official outlet. This has been See Tickets for a number of years now. There are however "agencies" (or "touts" to you and me) who sometimes claim to have tickets or hospitality packages for sale. They will not receive any official allocation so if you give your money to these people then the chances are you will lose it. Whatever you do, do not buy tickets on eBay or from any other private source. Tickets are personally identifiable and if you are not the person whose name and photograph are on the ticket then you run a very high risk of not getting in and you will have wasted your money. There are usually a limited number of re-sales of any tickets for which the balance has not been paid up during the first week in April or which have subsequently been cancelled. If you are trying to pick up a ticket in one of these sales it pays to keep an eye on the various website forums and festival news as they often happen with little or no advance warning. In 2017 two official resales took place on Thursday 20th April for coach package tickets and on Sunday 23rd April for general entrance tickets. In addition there are usually a few tiny allocations of returned tickets which are resold during May. The actual number of tickets available in the resales is never officially released but I reckon if you take a ballpark figure of somewhere between 10,000 & 15,000 you wouldn't be a million miles away. Tickets are non-transferable although you are able to change the delivery address if you move or if the details are incorrect. If you have to cancel your tickets for any reason you can get your money back, less a £20 administration charge (or £30 if you are cancelling a coach package ticket). You have until approximately 6 or 7 weeks before the festival to do this (by midnight on the 3rd of May in 2019). There is no refund available after this date as the tickets will have already been printed with your photograph and personal details. If you can't attend due to accident, illness or any other unforeseen circumstances then I'm afraid your only way of getting your money back after this date is by claiming on any insurance you may have which covers such eventualities. For the last few years See Tickets have offered cancellation insurance for an optional premium (£5:70 for ordinary tickets in 2019 or £7:25 for coach packages) which is payable when you settle the balance in April. In the past tickets used to be sent out during the first half of June and many people didn't receive theirs until a matter of a few days before they were due to leave for the festival. Naturally panic ensued but thankfully for the last few years they have started appearing through people’s letter boxes a week or two earlier. In 2016 my tickets were amongst the first to be received on 19th May. But it still takes a couple of weeks for all of the tickets to be sent out so don't panic if yours doesn't turn up straight away. In 2017 for example mine didn't arrive until 7th June. Anybody who orders their tickets online will receive a reference number and may use this to check on the progress of the distribution of their tickets via an order tracking facility on the See Tickets website. You’ll also need to enter details of the card you used to pay for your tickets or your post code to do this. Tickets are delivered in the UK by Royal Mail registered post. You’ll usually receive an email advising you that the tickets are on the way a couple of days before they are due to be delivered. If you are not at home when the postie tries to deliver the tickets you'll be able to pick them up from your local postal sorting office. Can I buy day tickets? Unless you live very close to the festival site then no I'm afraid you can't. There are usually a few thousand one day tickets for the Sunday alone but these are only made available to people living in Pilton and the surrounding towns and villages and details on how to obtain them are generally only ever published in the local press. When is the line up released? It varies year on year. According to Glastonbury folklore the festival never used to release the line up in advance at all and you would have very little idea who was appearing until you opened your programme when you got there. I'm not altogether sure how true this is but nowadays the headliners are often announced several months before the festival takes place. In recent times the names of a lot of the acts appearing on the larger stages are generally released in late March or early April. With the advent of social media Glastonbury receives a lot of criticism for not releasing its line up earlier in the same way that a lot of the other larger UK festivals do. To my mind this criticism is totally unjustified. The fact is that Glastonbury doesn't have to release its line up in order to sell its tickets and personally I enjoy the anticipation in the build up to the main release, especially as nobody outside of the inner sanctum at Glastonbury HQ knows exactly when that line up poster is going to drop. In a complete move away from tradition, Radiohead were announced as the Friday night headliner for the 2017 festival as early as 20th October of the previous year. The announcement was preceded by a teasing image of the band's bear logo appearing on the grass in front of the Pyramid Stage, which was spotted by eagle eyed viewers of the webcam. The Foo Fighters were announced for the Saturday night on 24th February with the final headliner, Ed Sheeran following on 16th March. A poster with a further 88 acts was published on 30th March and, as always, a few of the smaller stages and areas released their own schedules individually before the full line up for an incredible 100+ different stages and venues was released complete with running orders and set times on 30th May. If you want to get a better idea of when the various line up announcements have been made every year since 2000 the "The Glastonbury Thingy" might be of interest. Some people put together "Clashfinder" timetables so you can work out whether any of your favourite bands are likely to be playing at the same time. The one I use is on Halvin’s excellent “Clashfinder General” website which can be found HERE. You can customise it to your own requirements, highlight the acts you want to see and print it off to take with you to the festival. If you find the Clashfinder useful then buy Halvin a pint. He does it completely voluntarily. If you have an android or iphone the festival's official app is also a good way to work out your schedule for the day as well as having numerous other features. National Express run bus services to the festival from many major towns, cities and airports around the country. More details can be found on the official website as the Festival approaches or from the National Express website. For the first time in 2007 you could buy a combined coach and festival package ticket. This was introduced to encourage the increased number of ticket holders licensed to attend that year to use greener transportation methods. Anybody choosing the package option only gets their festival ticket given to them en route to the festival site in order to discourage them from subsequently changing their minds and arriving by car. Most of the buses arrive on the Wednesday and leave in the early hours of the Monday morning in order to avoid adding to the traffic congestion during peak departure times. Although there were a few teething problems with the combined coach arrangements in 2007, lessons definitely appear to have been learned and I have heard of nothing but positive experiences in subsequent years. And don't forget that if you choose one of the coach package deals you have the opportunity to secure your ticket prior to the main sale in early October. Buses drop festival goers at the Festival’s own Bus Station, which is close to Pedestrian Gate A at the north-western corner of the site. There is no train station at either Glastonbury or Shepton Mallet. The railway line which used to lead to Glastonbury, prior to Mr Beeching wielding his axe in the 1960s, actually used to pass through Worthy Farm and the disused embankment now forms one of the main vehicle and pedestrian routes across the site. The nearest train station is at Castle Cary, which is 6 miles from the festival site. Castle Cary is on the main line to the South West out of London Paddington Station. Full details of special train services are released as the festival approaches. A fleet of double decker buses provides a free shuttle service to all ticket holders from Castle Cary Station to the Festival. This service generally runs into the night for as long as trains continue to arrive so nobody needs to worry about being stranded overnight with all their gear on a station platform. The free bus service will drop you off at the Festival Bus Station close to Pedestrian Gate A and return you to Castle Cary at the end of the weekend. If you are traveling by car then don't forget that you will need to purchase a Car Park sticker (cost £45 in 2019). It's best to order this at the same time as you pay off the balance of your festival tickets in early April but it is possible to buy one later if you forget to do so at the time or if your travel arrangements change. You used to be able to simply ring See Tickets and add one to your existing ticket order but I understand that nowadays they will charge you an additional booking fee which seems a bit cheeky. As a last resort it is possible to buy a car park sticker when you arrive at the festival site but be prepared to pay a little more than face value as the price often increases by a few quid if you choose this option. While we're talking about car park stickers, a small word of caution if I may. It's sensible not to attach your sticker to your windscreen until shortly before you arrive at the festival site. This is especially applicable if you are stopping at motorway services en-route, where you will often find police pouncing on cars which are on their way to the festival in search of an easy drugs bust. Whether you have illicit substances on you or not, having the entire contents of your car rifled through is seriously inconvenient and a situation best avoided if at all possible. Another handy tip regarding car park stickers is that the glue they use to attach them to your windscreen is probably stronger than the stuff they used to stick the heat resistant tiles onto the space shuttle. Attaching the car park sticker to a piece of acetate and then blu-tacking that onto your car will mean you can keep the sticker for posterity and reduce the risk of an MOT failure for obscured visibility. Remember that everybody in your vehicle will need to show the stewards that they have a festival ticket before you will be allowed to enter the car parks. There are 2 main car parking areas and these are situated to either side of the site and the routes which you need to follow to get to them are colour coded, blue in the east and red in the west. Apart from that I’m afraid you have very little choice as to which of the dozens of car parking fields you end up in. You’ll just be stewarded into whichever one they happen to be filling at the time when you arrive. Very few of the main eastern car parks are particularly close to the nearest pedestrian gate and you will also have to scramble down the "Hill of Death", which isn’t anywhere near as dreadful as it sounds but is nevertheless a rough and fairly steep track. Access to the car parks to the west is comparatively flatter but with the rapid expansion of the site in this area over recent years you may find yourself parked in one of the newer "Pink" car parks on the northern side of the A361. Each of the car parking fields is colour coded and numbered so make sure you keep a note of which field you are parked in so you can find your way back to your car when you leave. In the past the car parks haven’t officially opened until the same time as the pedestrian gates, at 8am on the Wednesday morning. But with an unexpectedly large number of people turning up early in 2009, the roads around the site got very congested with traffic at a standstill waiting for the car parks to open. As a result, an amendment to the license in 2010 allowed the car parks to be opened from 9pm on the Tuesday evening. Since then many thousands of people have taken advantage of this every year and have already been in the car parks and queuing to get into the site long before the pedestrian gates open at 8am. In fact for the last couple of years some of the gates have been opened a little earlier than 8 in order to get the lengthy queues moving. The Festival has its own radio station, Worthy FM (wavelength 87.7FM), which often has traffic updates both before and after the festival so you can get a good idea of how long you are likely to be queuing for. Later arrivals will find themselves parked anything up to a mile away from the nearest pedestrian gate, so be prepared for a long hike. However you will probably have the advantage of a comparatively quicker getaway at the end of the weekend. Warning - Although the actual festival site is cleared of the resident cows some weeks before the festival, this isn't necessarily the case in the car parks so mind where you are putting your feet as you skip barefoot in excitement from your car! If you are being given a lift to the festival by a friend or relative who isn't staying then please note that vehicles will not usually be allowed to stop on the road close to the festival site. The Drop-Off Point is at the Bath and West Showground, which is sign-posted to the south of Shepton Mallet and from where you are able to get a free shuttle bus to the Festival Bus Station. If you are arriving by taxi then there is a taxi rank at the festival site and local taxi companies are given clear instructions on how to get there in order to avoid blocking the traffic when they are dropping off festival goers. If you are hitch hiking then please be very careful. The roads are narrow with high banks and few footpaths and the traffic can be very heavy. The majority of campervan drivers and people bringing a caravan approach via the "Blue Route" in order to access the fields specifically reserved for them to the east of the festival site. However, 2010 saw the introduction of 2 campervan fields in a separate area to the west which benefits from having its own pedestrian access gate into the main site. Approach the festival via the "Red Route" from the direction of Glastonbury and enter at the “White” gate in order to use these. Due to the adverse weather conditions in 2016 a number of campervans had to be relocated to the Bath and West showground and this was deemed to be such a success that you are now able to choose this as an alternative. A 24 hour shuttle bus service is available to ferry people to and from the site from here. Please note that security will not allow you to sleep in your vehicle if you park it in the ordinary car parks. You will need to buy a permit in advance. These cost £120 in 2019 and, whereas previously they weren't available until the ticket balances were payable in April, they have gone on sale (and sold out very quickly) in late October for the last couple of festivals. Another change in 2016 saw the name of the lead booker printed on the campervan permit in order to prevent people selling them on at a profit, as had previously been the case. You need to decide whether you want to be parked in the East or West Campervan Fields or at the Bath & West Showground at the time you buy your permit. There are at least 4,500 campervan pitches in the fields on the Eastern side but only about 1,000 to the West so the western ones do tend to sell out even quicker. There is also a designated quiet campervan area for families in the Eastern fields. I' m not altogether sure how many vans are catered for at the Bath & West Showground and the introduction of this option doesn't really seem to have reduced demand for the campervan passes, which sell out even more quickly than the festival tickets when they go on sale. The rules as to what does and doesn't constitute a campervan seem to change on a regular basis so check out the Campervan Information on the Official Website and keep an eye out for last minute changes in arrangements, which invariably seem to happen. As a general rule of thumb you must have permanent cooking or washing facilities in order for your van to be allowed entry so an old transit van with a mattress and a bucket in the back won’t cut the mustard I’m afraid. Family and friends can usually camp with you. Officially they are only able to pitch their tents behind your vehicle and within the allotted space but this never seems to be enforced particularly rigidly as you can see from my family's 2015 encampment above. Awnings are allowed provided they are reasonably sized although a friend of mine reckons that he gets away with erecting one which is so large that the stewards are often a little concerned that he might be planning to start up his own dance tent! The East and West Campervan Fields are some of the few parts of the festival which are positioned outside of the main fence. However the fields are still secure and are protected from possible intruders by some of the fencing which used to surround the main site before the “ring of steel” superfence was introduced in 2002. You will have to queue and run the gauntlet of security searches each time you enter the festival and it can be a bit of a hike so it's as well to take everything you need for the whole day and use the Property Lock Ups to store anything that you don't want to carry around with you all day. Some people actually go as far as pitching a small tent inside the festival so that they have somewhere more convenient to store warm clothes and other gear. There are toilet, water and some catering facilities in the Campervan Fields, although it is often felt that these could do with being more widely available and better maintained. Unfortunately the organisers of many festivals appear to be under the impression that all campervans have the luxury of an onboard toilet and the sanitation provisions in these fields can often be somewhat inadequate as a result. If your van does have a loo then there are chemical waste disposal points in the campervan fields. Please dispose of your waste into these rather than pouring the contents of your toilet cassette into the composting loos. Also please note that the "No Glass" rule applies just as much in the Campervan Fields as it does in the rest of the festival site and your van may be searched to ensure that you have no bottles or other glass items when you arrive. It's as well to leave any sharp knives which could be perceived as weapons at home as well. This always seems a bit silly to me as you can stab somebody with a tent peg but you can't slice a tomato with one. Rules are rules however! I actually had my bread knife confiscated at another festival recently. There is no electrical hook up available in the Campervan Fields and generators are banned so make sure that your leisure battery is fully charged up before you arrive and be sparing on how much juice you use in order to make it last for 5 or 6 days. If you are worried that your battery won't last for the whole festival then it might be worthwhile investing in a spare one or a solar powered trickle charger. If you absolutely have to run your engine to recharge your battery then please keep it to a minimum and do it at a time of day when you are not going to annoy your neighbours with noise and diesel fumes. The Campervan Fields are open to punters from the Tuesday lunchtime nowadays although you won’t be able to access the main site until the pedestrian gates open at 8am on the Wednesday. If you are arriving on the Tuesday you may well find that the caterers in these fields won't be up and running yet so take enough food with you to at least keep you going until the Wednesday morning. The photograph above was taken from the roof of my van in the West Campervan Fields on the Tuesday afternoon in 2017. As you can see I was able to park very close to the perimeter fence and less than a minute's walk from the dedicated pedestrian gate. There is secure parking for motorbikes near to Gate A in the north western corner of the site. See the official site's guide on taking a bike to Glasto. If you cycle you will be allowed to take your bike into the festival and use the Property Lock Ups to store it safely. Some people actually use their bikes to get around the site although this does become difficult and rather dangerous once the paths and trackways become congested with pedestrian traffic. 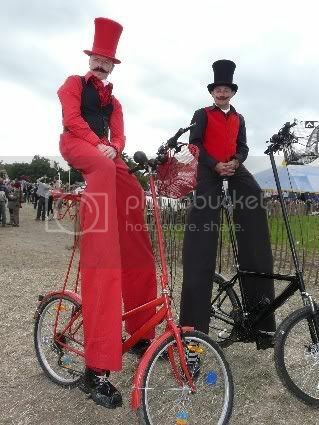 For the last few years the festival has introduced an initiative to get more people to cycle to the festival. Cyclists have the use of their own designated camping space in the Darble camping field close to Pedestrian Gate A, with private showers and lock up facilities. They also receive discounts on meals and festival merchandise. "The nearest airport to the festival is Bristol International from where you can sometimes get a coach transfer direct to the festival. National Express also run coaches from London Heathrow - see the official website for further information. Alternatively you could either share a taxi or hire a car at the airport. The cost of a taxi from Bristol is roughly £60. The easiest way to travel to the festival by public transport is to get the Airport Flyer bus into Bristol city centre and get connecting transport from there. The fare on the Airport Flyer is £7 single or £11 for a return. This service stops at Temple Meads train station and Bristol bus station. Buses run direct to the Festival from Temple Meads and trains to Castle Cary. National Express coaches also run to the festival from the bus station. When you leave the festival, make sure you leave plenty, and I do mean PLENTY, of time to get back to the airport. Bear in mind that you will be competing with all the other festival traffic heading towards Bristol and the M5. If you are using public transport, you will have to change onto the Airport Shuttle bus in Bristol in order to get back to the airport. When you arrive at the airport you might find you have a bit of trouble checking in your rucksack. Unless your rucksack and all its loose straps are fully self-contained you may find that you are encouraged to join the "Non Standard Luggage" queue. Bristol is a relatively small airport and doesn't have much capacity for dealing with non-standard baggage so having to queue a second time could well add an extra 30 minutes onto your check-in time. I've seen situations in the past where people have been in danger of missing their flights as a result of this delay." There is a comprehensive recommended kit list on the Official Website. Wet wipes might sound an odd item to include, and have come under some criticism lately for not being particularly environmentally friendly, but they are an absolute godsend if you don't fancy slopping water round your tent or baring your dangly bits for a wash in full view of 200,000 fellow campers. Don't forget sunscreen and a hat. The festival is held on the weekend immediately following the summer solstice so the sun is at its strongest and, apart from the obvious health issues, sleeping on rough ground with sunburn is no fun at all. We had an unusually hot Glastonbury in 2010 and literally thousands of people ignored the advice to slip, slap and slop and had to be treated for sun stroke and heat exhaustion as a result. On the other hand it can also get surprisingly cold at night so a good warm jumper or fleece is essential for those night time shenanigans in the Naughty Corner and up at the Stone Circle. Avoid denim jeans as they take a long time to dry if they get wet. You're much better off with cargo pants made of cotton or technical synthetic materials which are lighter and will dry quickly and they also have plenty of big, secure pockets for all your essentials. Always remember the age old festival goers' saying that "there is no such thing as bad weather - just inappropriate clothing!" As long as you have clothes which keep you shaded when it's sunny, warm when it's cold and dry when it's wet then you will be fine. There are dozens of stalls selling all manner of clothing if you need to add to your festival wardrobe. Personally I also enjoy a few creature comforts and would add things like a tent light and a camping chair but these are by no means essential if you are traveling light. Another handy addition is an empty fabric conditioner bottle which, because of the wide neck, makes a very adequate unisex in-tent toilet for when you get caught short and don't fancy having to get dressed to go marching in the rain to the nearest loo. Lads with reliable aim can usually make do with a plastic milk bottle. Alternatively, “Travel Johns” are also available from camping stockists. These contain a gel similar to that found in disposable nappies. How do I carry my gear? I really can't emphasise enough just how BIG Glastonbury is. Remember that you could have to carry all of your gear a very long way up and down hills and over rough (and sometimes muddy) terrain. Possibly as much as two miles in each direction. So make sure that you have the means to transport your gear safely without bags splitting or you or your trolley collapsing. If you have a car then it is always better to make two or more trips than to end up stranded in the rain halfway between car and camp site with your gear strewn all over the ground. I have an 80 litre rucksack, which I have used in the past for traveling round Asia, and is therefore easily big enough to carry my sleeping bag and more than enough clothes for a week. My rucksack has a waterproof cover which I can just slip over the top if it starts to rain. If you don't have one of these then make sure you pack everything into sealed plastic bags before they go into your rucksack so that if you get a soaking between the car park and the camp site you will at least be assured of having dry clothes and bedding when you've got your tent up. Note the large inflatable tyres (complete with genuine Glastonbury mud) and sturdy tubular steel construction, which are essential in order to deal with the rough ground. I got it from my local garden centre for the princely sum of £17.99. I have used this at every Glastonbury since 2003 and plenty of other festivals as well in order to carry a five-man tent, a double airbed, a collapsible chair, all my other camping gear and 48 cans of beer with room to spare. It can also double up as a three-seater bench or even a Heath Robinson shower if you strap a water carrier to it and squat underneath the tap. Other successful means of transporting gear are wheelbarrows, wheelie bins or basically anything else that is sturdily constructed and has large wheels, but make sure you have plenty of rope, straps or strong bungee cords in order to hold everything in place over the humps and bumps. Sledges also seem to work well in wet conditions. Definitely out are suitcases and wheelie bags, shopping trolleys, or lightweight collapsible trolleys, which I know from personal experience tend to collapse of their own accord just when you least expect or want them to. Sadly the village store in Pilton closed its doors for the last time in 2012 so I'm afraid that nowadays there aren't any shopping facilities within easy walking distance of the festival. But don’t worry! There are several General Purpose stalls on site. They might be a little more pricy than your local Lidl but they are extremely useful for replacing those everyday commodities which you somehow managed to leave at home or run out of during your stay. As a new development for 2019 The Co-Op have publicised that they will have a store onsite. You can read their announcement of this development here including news of the fact that they are looking to open a new shop in the village. If you absolutely have to leave the site for supermarket supplies, regular buses run to both Glastonbury and Shepton Mallet. Have a chat with the helpful people on the Info Points for timetables showing when these run.